Training Course in the field of "Good Practices in Emergency Situations for Transboundary Animal Diseases"
The National Consultative Meeting on "Agricultural Extension and its Role in Achieving Sustainable Agricultural Development"
Training Course in the field of “Risk Management for Transboundary Animal Diseases"
Training Course in the field of "Risk Management of Transboundary Animal Diseases"
Training Course in the field of "Fish Farming in Freshwater"
H.E Prof. El Dukheri participates in the International Salon for Agricultural Investment and Technology "SIAT 2018"
Training Course in the field of "Developing Statistical Programs and Agricultural Information"
Training Course in the field of "Modern Technologies for Producing and Exporting Vegetable and Fruit"
H.E the Minister of Finance and Economic Planning of Sudan inaugurated the workshop on "A Future Vision for Sudan's Arab Food Security Initiative"
Training Course in the field of "Integrated Rangeland Management"
AOAD Director General Continued his Efforts to Create Global Partnerships Eliminating Hunger and Achieving Food Security in the Arab Region. Training Course in the field of "The Skills of Transforming Creative Ideas into Action Plans"
Training Course on "Epidemiological Mapping and Early Warning of Infectious Abortion (Brucellosis)"
Training Course on the "Use of Statistical Packages for Estimating Food and Agriculture Animal Genetics"
Training Course on "Remote Sensing and its Applications in the Agricultural and Fisheries Sector"
Training Course on "Designing Epidemiological Surveys and Analyzing Data for Brucellosis"
Training Course for Trainers (TOT) on "Epidemiological Maps and Early Warning of Foot and Mouth Disease"
Training Course under the topic "Modern Technologies in the Field of Improvement and Maintenance of Land"
Training Course on "Communication and its Importance in Agricultural Extension"
Training Course in the Field of " Use of Telecommunication Systems in Disseminating Information and Agricultural and Fishery Technologies"
Training Course in the Field of "Integrated Crop Management using Agrometeorological Data "
Training Course in the Field of "Estimating the Technological Value of Egyptian Cotton"
AOAD Organized a National Training Course in the Field of "Laboratory Diagnosis of Diseases Using (PCR) Technique"
‎AOAD organizes a National Training Course on the " Description, propagation and preservation of plant genetic recourses in the gene banks and the different conservational approaches", Doha, Qatar: 20-24/04/2014. ‎H.E Dr. Al-Zadjali, The Director-General of The Arab Organization for Agricultural Development (AOAD) says collaboration of AOAD and BADEA focuses on the development of the human resources of the African countries in the fields of agricultural development and food security. ‎ (22) trainees, from (8) Sudanese States successfully completed their training on Good Agricultural Practices(GAP) on Mangos . ‎ The Arab Organization for Agricultural Development (AOAD) launches two national training courses at its H.Q in Khartoum, Sudan, one on SPSS and the other on Good agricultural Practices (GAP)for Mango. ‎ The Arab Organization for Agricultural Development (AOAD) signs an agreement with the Ministry of Agriculture, Forestry and Irrigation in South Darfur State, Sudan, for the construction of a rural women School in Buram. ‎ The Director General of The Arab Organization for Agricultural Development (AOAD) receives the Minister of Agriculture , Livestock and Irrigation in Khartoum State , Sudan. ‎ The Expert Group on the Development of a Draft Unified Arab Guidelines Regulations for Aquaculture, meets at AOAD Head Office , Khartoum , Sudan, 29/03/2014. ‎ Signing of the Host Agreement for the Premises of AOAD Regional Office in the Arab Mashriq Region. ‎ Meeting of the Expert Group on the Development of a Unified Arab Strategy for Aquaculture (UASAQ), in Khartoum, Sudan, 23/3/2014. ‎ The Arab Organization for Agricultural Development (AOAD) participates in the 2nd Africa-Arab Economic Forum, Kuwait 11-12, November 2013. ‎ The Arab Organization for Agricultural Development (AOAD) organizes a training course on "Veterinary Health Care for Poultry Projects, Khartoum, Sudan. ‎ Training Course on "Development of the Skills of Users of Remote Sensing Technologies in Downloading and Processing high-resolution Satellite Imagery. Cairo, Egypt 11-12/11/2013. 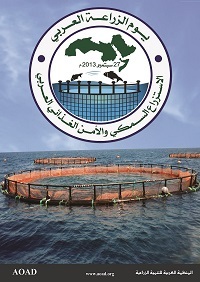 ‎ AOAD participates in the 5th edition of the International Exhibition of Fishing and Aquaculture (SIPA 2013), Oran, Algeria, 6-9/11/3013. ‎ The D.G of AOAD presides a Coordinative Technical Meeting on Pest Control by using of Irradiation, Jordon, 23-24/10/2013. ‎ AOAD Organizes a Training Course on Pesticides and their Safe Use at it's Regional Office for The Central Region, Cairo, Egypt, 28-30/10/2013. The Arab Organization for Agricultural Development (AOAD) signs a one million fifty thousand Egyptian Pound contract for the supply of Corn kernel strippers (Farata) to small farmers in Egypt. AOAD and The Ministry of Agriculture , Jordon, sign an agreement to construct an earth Dam at Al-Azraq. Training course on " Diagnosis and Control of Poultry Diseases".